From bloodthirsty conquest to exotic romance, stereotypes of Spain abound. 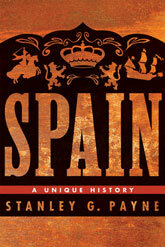 This new volume by distinguished historian Stanley G. Payne draws on his half century of experience to offer a balanced, broadly chronological survey of Spanish history from the Visigoths to the present. Who were the first “Spaniards”? Is Spain a fully Western country? Was Spanish liberalism a failure? Examining Spain’s unique role in the larger history of Western Europe, Payne reinterprets key aspects of the country’s history. Topics include Muslim culture in the peninsula, the Spanish monarchy, the empire, and the relationship between Spain and Portugal. Turning to the twentieth century, Payne discusses the Second Republic and the Spanish Civil War. The book’s final chapters focus on the Franco regime, the nature of Spanish fascism, and the special role of the military. Analyzing the figure of Franco himself, Payne seeks to explain why some Spaniards still regard him with respect, while many others view the late dictator with profound loathing. Framed by reflections on the author’s own formation as a Hispanist and his evaluation of the controversy about “historical memory” in contemporary Spain, this volume offers deeply informed insights into both the history and the historiography of a unique country. Stanley G. Payne is the Hilldale–Jaume Vicens Vives Professor of History at the University of Wisconsin–Madison. His many books include The Franco Regime: 1936–1975; Fascism: Comparison and Definition; Spain’s First Democracy: The Second Republic, 1931–1936; and A History of Fascism, 1914–1945, all published by the University of Wisconsin Press.